With last week's release of revised GDP statistics for Q3/15, we learned that after-tax corporate profits in the 3rd quarter were down 3.2% from the second quarter, but were up 1.4% from year-ago levels. The growth in profits has slowed significantly in recent years, but profits were still 9.9% of nominal GDP last quarter, just shy of their all-time high of 10.8%, which was set three and a half years ago. 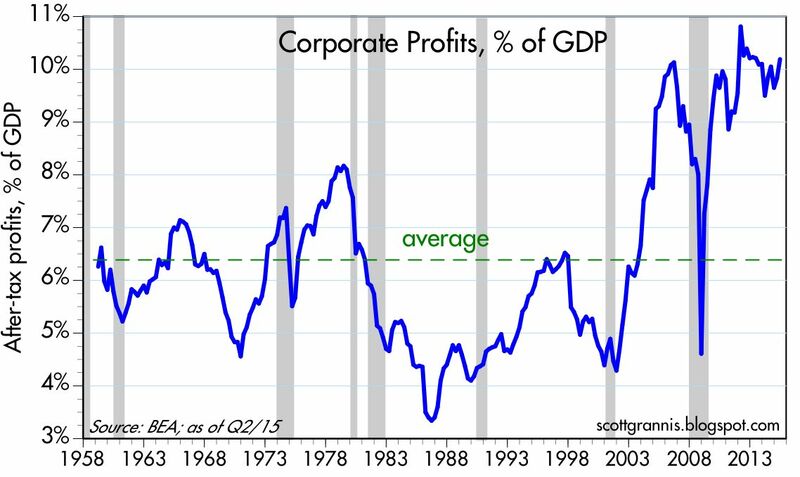 To put that in perspective, consider that after-tax corporate profits have averaged about 6.5% of nominal GDP since 1959, and as recently as 11 years ago, profits had never exceeded 8% of GDP. At a time when corporate profits have been unusually strong relative to nominal GDP, it is worth noting that investors' valuation of those profits (i.e., how much they are willing to pay per dollar of profits) is only about average, according to a variety of measures detailed below. Current valuations thus appear to incorporate a substantial amount of skepticism about future profits. 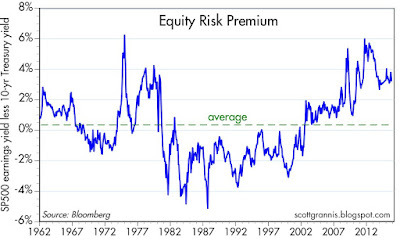 Put another way, there is no evidence here that equity valuations are in "bubble" territory. 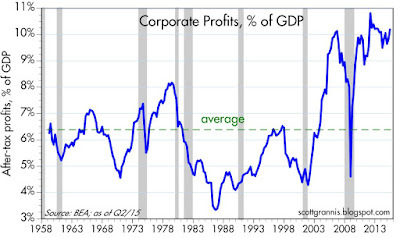 Instead, and as I've been noting for years now, it would appear that the market is priced to the expectation that corporate profits will sooner or later regress to their long-term mean—which would in turn imply years of no growth or declining profits. 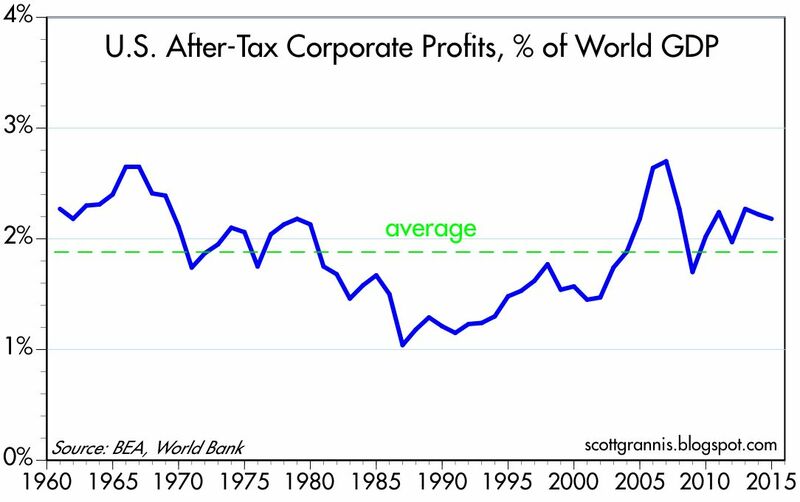 But as I've also noted, that may be an overly pessimistic view, given that corporate profits today are about average when compared to global GDP. 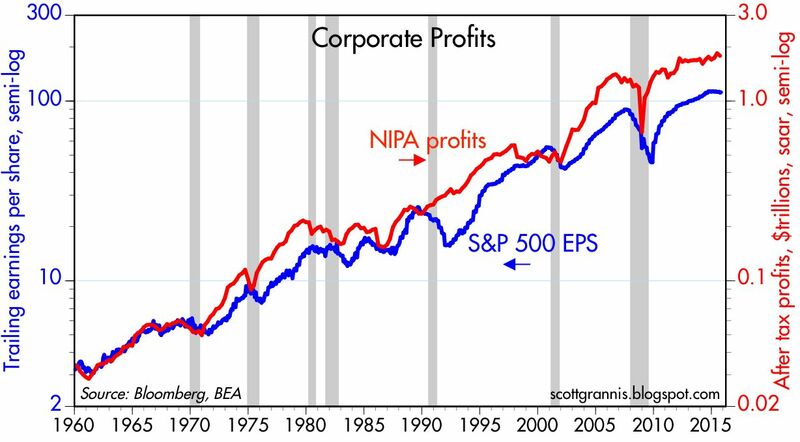 The chart above shows two versions of after-tax corporate profits: one, a comprehensive measure compiled by the National Income and Product Accounts (aka the GDP stats), and the other the earnings per share of the S&P 500 companies. Both are close to all-time highs, and both have increased by roughly the same order of magnitude over the past 5-6 decades. 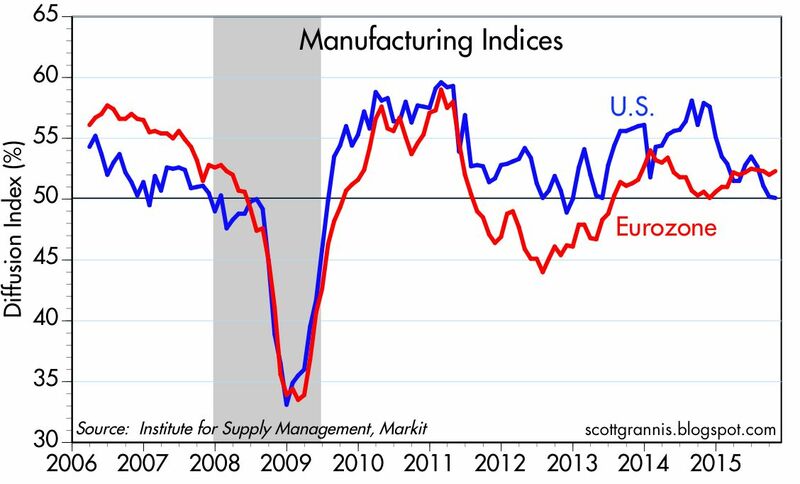 Both show relatively slow growth of late. There are some important differences between the two which I discuss in detail here, but by and large they are telling the same story. The chart above compares the NIPA measure of after-tax corporate profits to nominal GDP. This has averaged about 6.5% since the 1950s, but for the past several years it has been significantly higher. Is this series mean-reverting? That is the question investors have been asking themselves for years. Many worry that it is. I've been arguing for years that corporate profits relative to GDP are not necessarily going to revert to their historical mean of 6.5% because of globalization. Major U.S. companies now earn a substantial portion of their profits overseas, and overseas markets have grown much faster than than the U.S. market (think China and India). 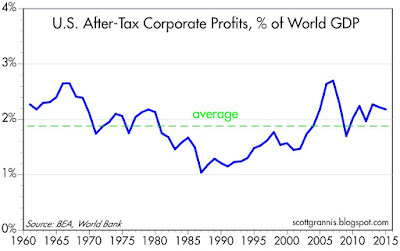 When profits are measured relative to global GDP (see chart above) they are only slightly above their long-term average. 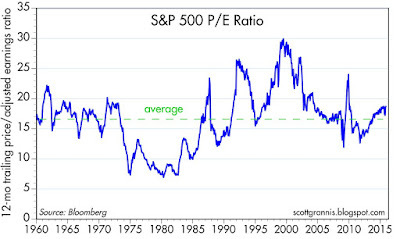 One traditional measure of valuation is the ratio of equity prices to earnings, shown in the chart above. Here we see that current PE ratios of 18.6 (according to Bloomberg) are only moderately above their long-term average of 16.7. Valuations today aren't even close to what they were in 2000, when we now know stocks were in "bubble" territory. 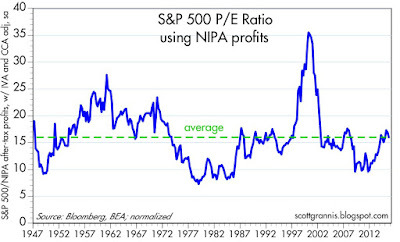 The chart above is my version of PE ratios: it uses the S&P 500 index as a proxy for the price of all companies, and it uses the NIPA measure of after-tax profits as the "E." I've normalized the series so that its long-term average is similar to the standard PE measure shown in the previous chart. Here again we see that valuations today are about average. When real yields on TIPS were around 4% in the late 1990s,the U.S. economy was booming and investors expected the good times to continue to roll. That expectation was fully embedded in PE ratios, which were unusually high. Investors were so confident that economic growth and profits would be strong that they were willing to pay a huge price for those profits. 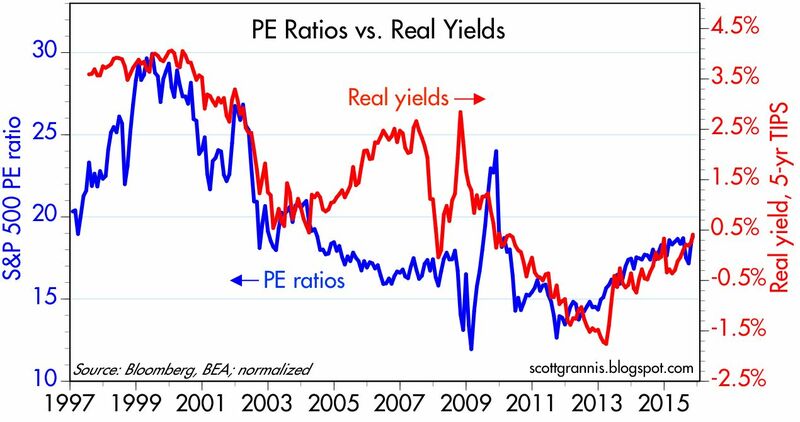 Since then, growth expectations and real yields have declined and, not surprisingly, PE ratios are much lower. The market is not very enthusiastic about the prospects for growth and profits, and that's why equity valuations today are merely average. It's a cautious market, not an irrationally-exuberant market. But on the margin, real yields and PE ratios have been moving higher; the market is becoming less risk averse as confidence slowly returns. 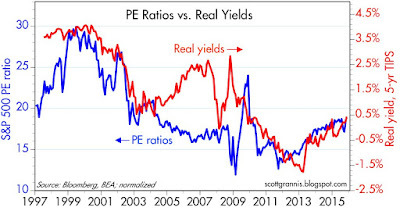 Caution is also reflected in the chart above, which shows the difference between the earnings yield on stocks (the inverse of PE ratios) and the yield on 10-yr Treasuries. In order to satisfy investors' aversion to risk, the market demands a yield on stocks that is about 4% higher than the yield on safe Treasuries. 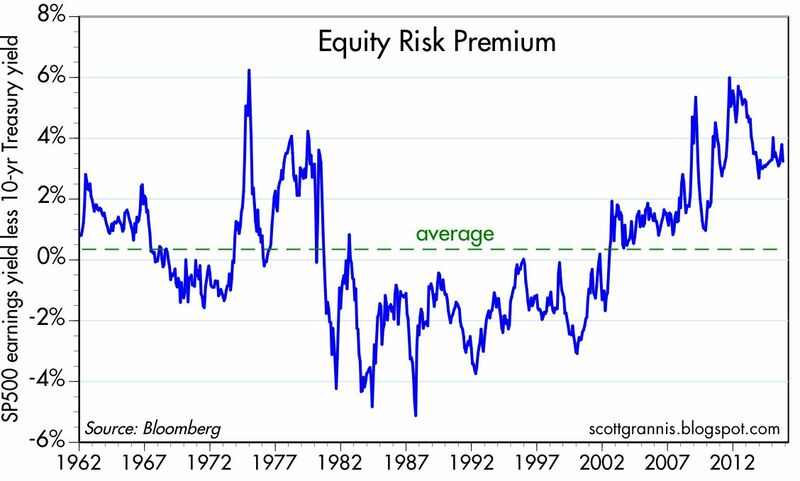 Today's equity risk premium is substantially higher than its long-term average. 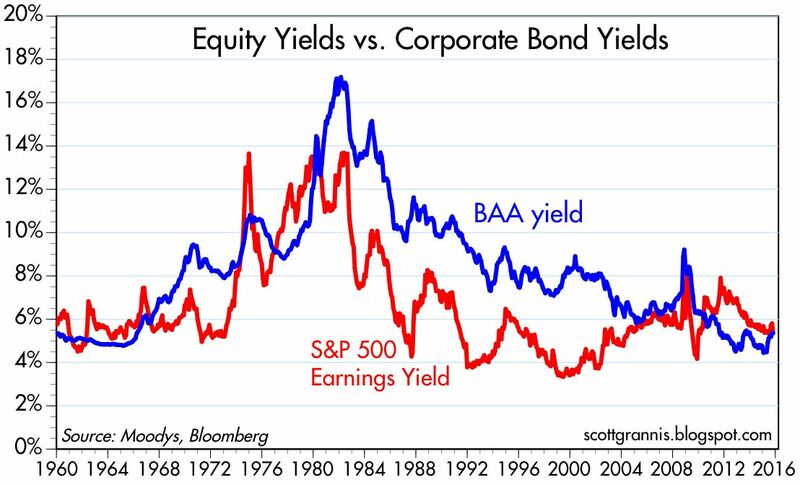 The chart above compares the earnings yield on stocks with the yield on BAA corporate bonds (a proxy for the typical large company that issues bonds). Finance theory would say that in "normal" times the yield on a company's bonds should be higher than the yield on its equity. That's because the potential return to owning corporate bonds is limited to their coupon, whereas the potential return to owning stock is theoretically unlimited, since earnings can grow significantly over time. Investors should be willing to pay a higher price for the stock (and consequently accept a lower yield) than for a bond of the same company. 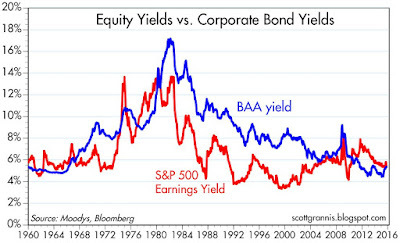 Today bond yields and earnings yields are about the same. For the same price as a bond, equity investors get much more upside potential; that in turn implies that equity investors don't see much upside potential—if any—to corporate earnings. 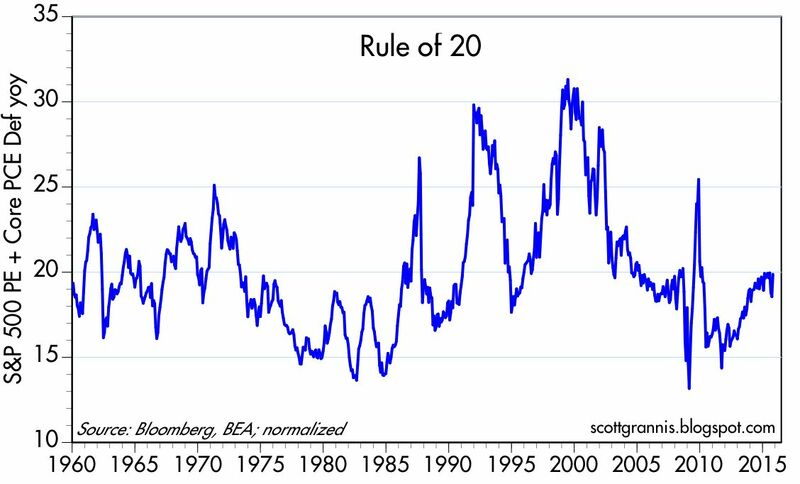 The chart above illustrates one simple rule of thumb which attempts to reveal whether stocks are over- or under-valued, or just about right. 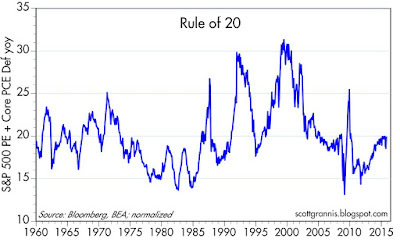 The Rule of 20 says that the stock market is fairly valued when the sum of the average price-earnings ratio and the rate of inflation is equal to 20. Above that level, stocks begin to get expensive; below it, they’re bargains. In the chart I've added together the EPS of the S&P 500 and the year over year rate of inflation according to the core PCE deflator, the Fed's preferred measure of inflation. The sum today is just about exactly 20 (18.6 + 1.3), which puts equity valuation squarely in "average" territory. 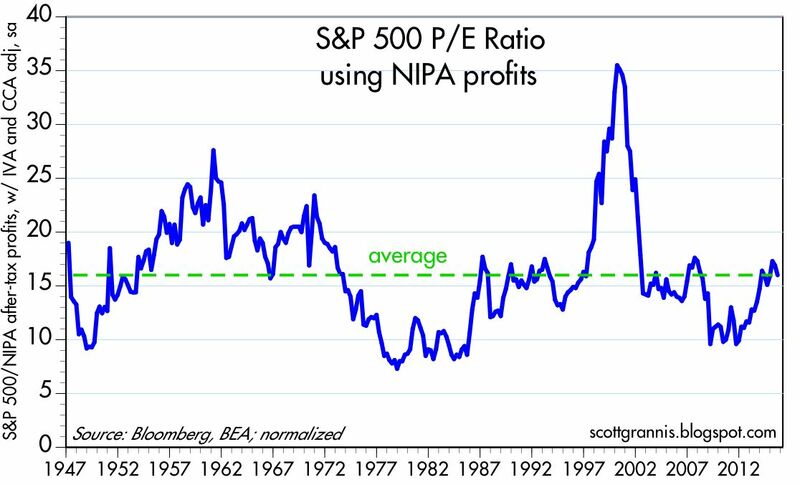 To summarize: if there is a common theme to the charts and discussion above, it's that stocks are not obviously over-priced or under-priced. Valuations are likely in the range of what a conservative investor might call "reasonable." The citizens of Argentina today turned a new page in Argentine history by voting out the Peronists after 12 troublesome years of rule. I've written several times over the years about the ravages of Peronism and the disturbing echoes of the same here in the U.S. It's a relief to know that things should be changing for the better. Congratulations to all my friends and family in Argentina! The new president, Mauricio Macri, promises to be much more business friendly than the outgoing Cristina Kirchner. Although he is quite likely to officially devalue the peso, it will only be to the extent that it has already been devalued in the black market. If he successfully pursues the right policies—liberalizing the exchange rate market, lowering the punitive taxes and tariffs on exports, and squeezing out wasteful and corrupt government spending, to name just a few—it would not be surprising to see the peso strengthen a bit from the 15 pesos/dollar level that has prevailed in the black market. Once capital knows that it is free to leave, once creditors know that their loans will be repaid, once exporters know they can keep the fruit of their efforts, then the capital outflows of recent years should reverse. Already the stock market has been celebrating in anticipation, turning in one of the strongest performances in the Western Hemisphere. Like the U.S., the Argentine economy has been underperforming for years. It only takes a few things to go right in order to unleash stronger growth. PS: Macri takes over beginning December 10th. Outstanding loans at U.S. banks have increased over $800 billion in the past 12 months, and have been increasing at about a 7.5% annualized rate over the past year and two years. 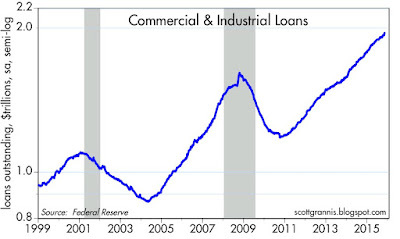 One area of bank lending—Commercial & Industrial Loans—has been expanding at 10.5% annualized pace for the past 5 years, and has expanded by over $200 billion in the past year, up 11.6%. 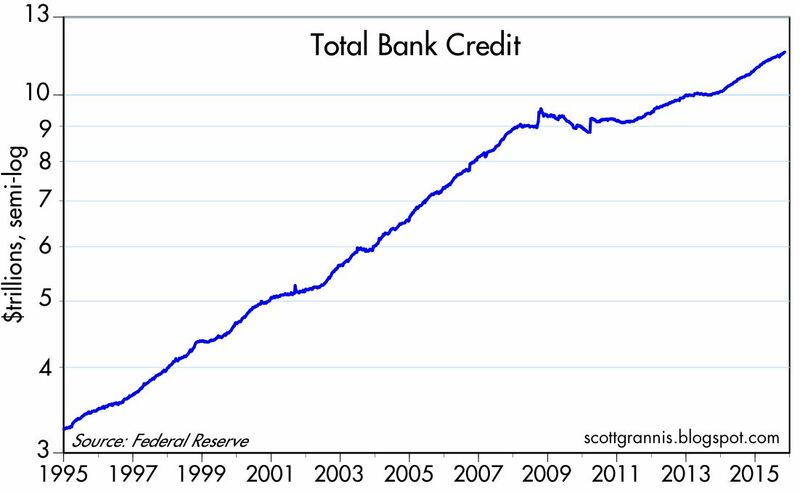 Banks still have over $2.5 trillion of excess reserves (reserves in excess of what is required to collateralize their deposits), so bank lending could theoretically continue to expand at heady rates almost indefinitely. 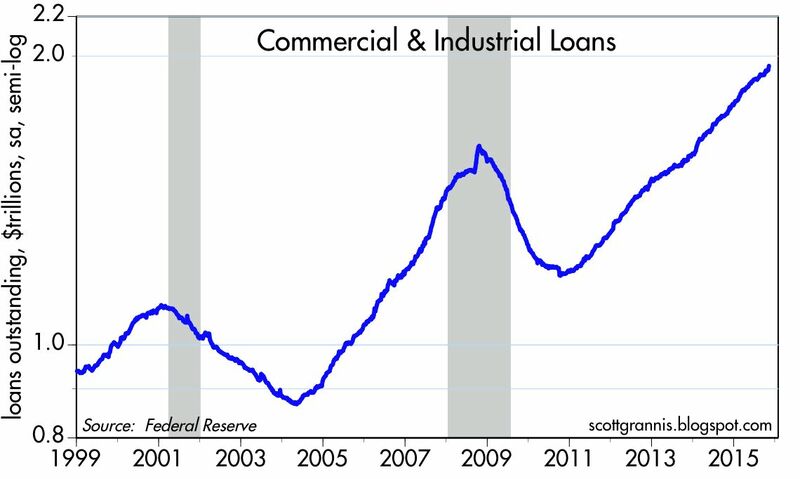 As the chart above shows, the pickup in bank lending got started about two years ago, after being very weak from 2008 through 2013. It may just be a coincidence, but bank lending started picking up right around the time—in early January 2014—the Fed announced that it would "taper" its purchases of notes and bonds, which turned out to be a prelude to the end of the third round of Quantitative Easing. Prior to that time, banks had apparently been eager to accumulate excess reserves, and relatively unwilling to lend to the private sector. In effect, by accumulating excess reserves, banks were lending principally to the Fed. 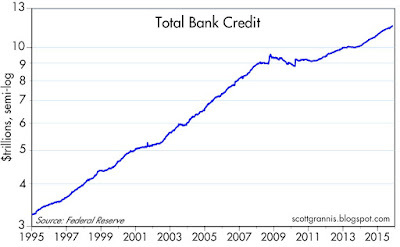 In the past two years this has shifted, with banks lending much less to the Fed and much more to the private sector. C&I Loans (shown in the above chart) are a good proxy for bank lending to small and medium-sized companies—those that are too small to access the capital markets directly by selling bonds. They've been on a tear every since the end of 2010. I've interpreted this to mean that banks as well as businesses have become more confident in the future: banks are more willing to lend, businesses are more willing to borrow. Lending isn't always good for economic growth, but in this case I think it has helped boost growth, because it is the result of increased confidence. The big international corporations may be borrowing to fund dividends and buybacks (and avoid double and triple taxation on their foreign profits), but I doubt that is the case with much smaller companies. There is no sign here of any deterioration. Lending activity remains robust, and that suggests that the underlying economic fundamentals of the economy have not deteriorated and are possibly even improving. This lends support to the Fed's decision to start normalizing interest rates. Since increased lending is a reflection of a reduced demand for money (borrowing money is like shorting a stock: you benefit if the value of the stock declines), it is entirely appropriate for the Fed to adopt a policy that attempts to offset that decline in the demand for money. Raising the interest it pays on excess reserves makes banks more willing, on the margin, to hold those excess reserves and less willing to increase their lending to the private sector. However, increasing IOER to 0.5% is unlikely to make a big difference, so we should expect to see further rate hikes going forward. The risk the Fed runs is raising rates too little, too late. That's what has happened in nearly every business cycle expansion, and it explains why inflation almost always rises until the point when the Fed has finally "caught up" and tightened by enough to severely constrain the supply of credit—at which point the economy slips into recession. We are still years away from another of these credit roller-coaster rides, but that doesn't mean we don't need to worry. Today the release of the October FOMC minutes increased the likelihood (now about 70% according to implied pricing) of a modest rise in short-term interest rates next month. The market has been dreading such a move for years, but now that it is finally upon us, investors are shedding their fears, albeit slowly. 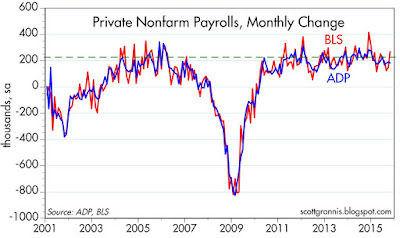 After all, if the Fed is confident enough to end ZIRP, shouldn't we all be a bit more confident in the future? 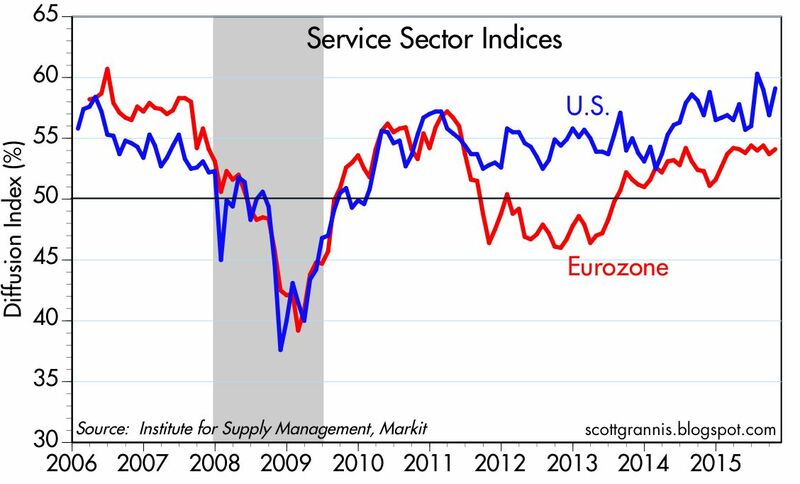 The economy is certainly not sizzling, but neither is it sputtering. 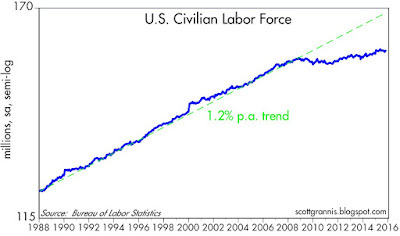 It's been growing at a 2 - 2.5% pace for some six years now—the weakest recovery ever, to be sure, but a fairly steady one. Moreover, the economy has already withstood several shocks over the years—the PIIGS crisis, a Greek default, the fiscal cliff negotiations, the collapse of oil and commodity prices, and the devaluation of the Chinese yuan and the plunge in Chinese stocks—without skipping a beat. Perhaps most importantly, the prices of gold, stocks, and TIPS have been pointing to better times ahead for some time now. The chart above shows the ratio of the S&P 500 index to gold prices, and it is divided into periods in which the ratio was rising (white) and falling (green). The numbers in red show the annualized rate of GDP growth during each period. 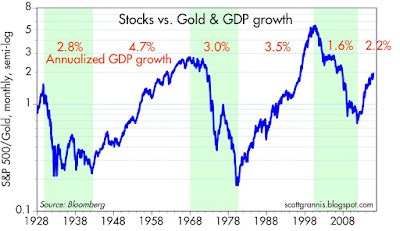 Growth has been slower during times when gold is outperforming stocks, and faster when gold is underperforming. The ratio has been trending up for several years now, suggesting that growth could pick up further in the years to come. Investors tend to prefer gold during times of great uncertainty, and they tend to shun gold during times of rising confidence. Think of the green periods as times when investors run away from financial assets and embrace hard assets, and the white periods as times when financial assets look more attractive than hard assets. Good times for financial assets mean investment is generally strong, and investment is ultimately what drives growth. Gold prices started falling in early 2011, and a year or so later TIPS prices started falling as well (the chart above uses the inverse of the real yield on TIPS as a proxy for their price). I've referred to this chart repeatedly in recent years, citing it as a good sign that pessimism is being slowly replaced by optimism. 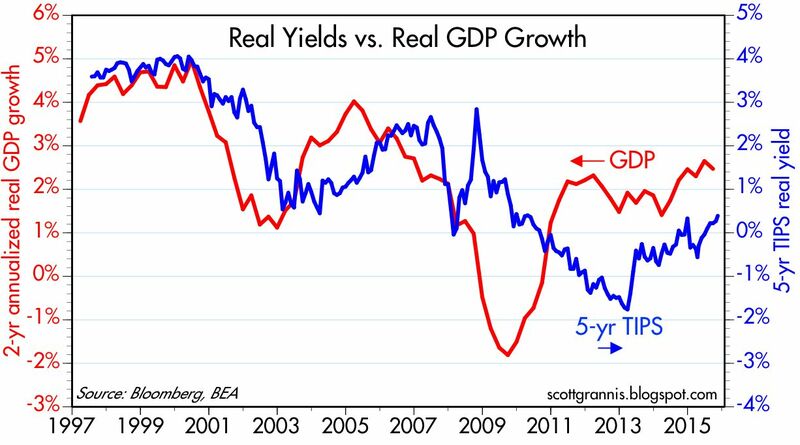 Falling TIPS prices are the flip side rising real yields, of course, and real yields tend to track the economy's underlying real growth rate. 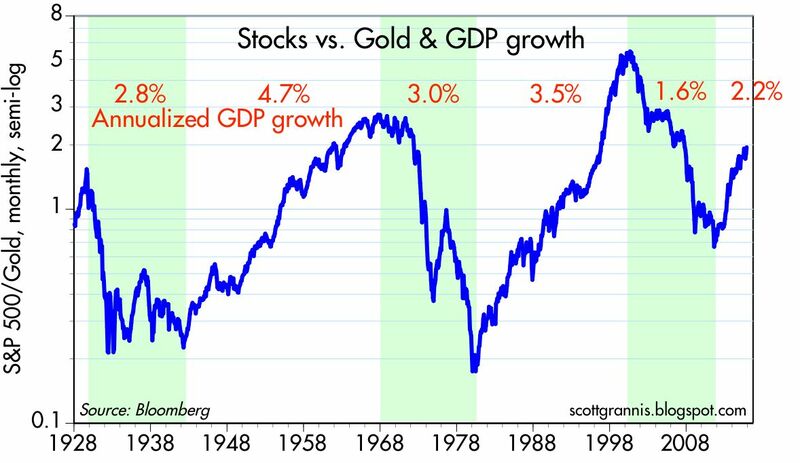 So falling gold and TIPS prices are good signs that the market is becoming more confident about economic growth, and all this has happened as stocks have outperformed gold. 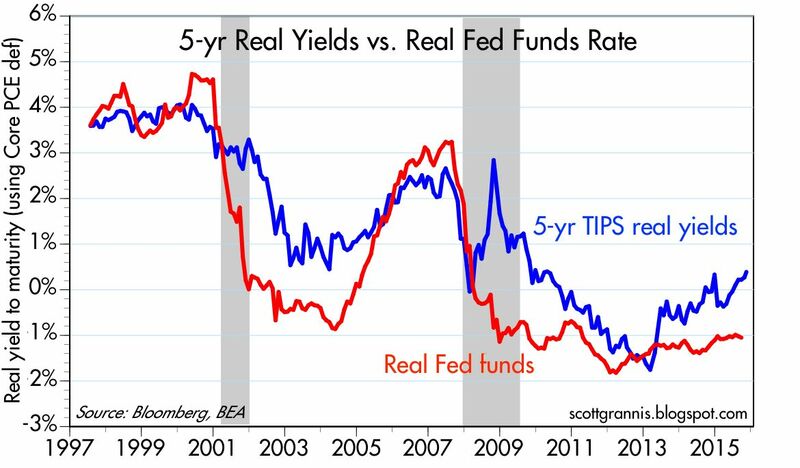 Real yields on 5-yr TIPS can be thought of as the market's expectation for the average real Fed funds rate over the next 5 years. Rising real yields over the past two years are a sign that the market has gradually become more confident that the Fed would sooner or later start raising real short-term interest rates. In the years to come, we are likely to see both TIPS real yields and real short-term rates continue to rise, and they should be accompanied by an improving economic growth outlook. 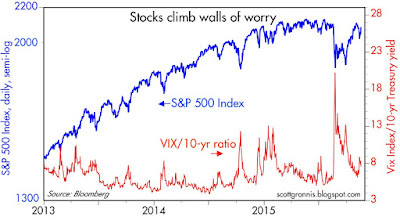 The chart above compares stock prices (blue) with the ratio of the Vix index to 10-yr Treasury yields (red), the latter being a proxy for the market's fears, doubts, and uncertainties. Every selloff in stock prices has been accompanied by a sharp rise in the market's fears, while rallies have tended to occur as fears have subsided. 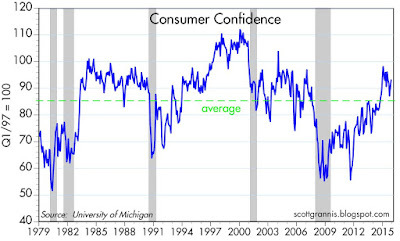 Not surprisingly, as the chart above shows, consumer confidence has been rising since 2011, along with the fall in gold and TIPS prices, and the rise in stock prices. All of the above point to better times ahead, driven fundamentally by improving confidence. The year over year change in the CPI has been roughly zero for the past 10 months, but that's purely a function of sharply lower oil prices. 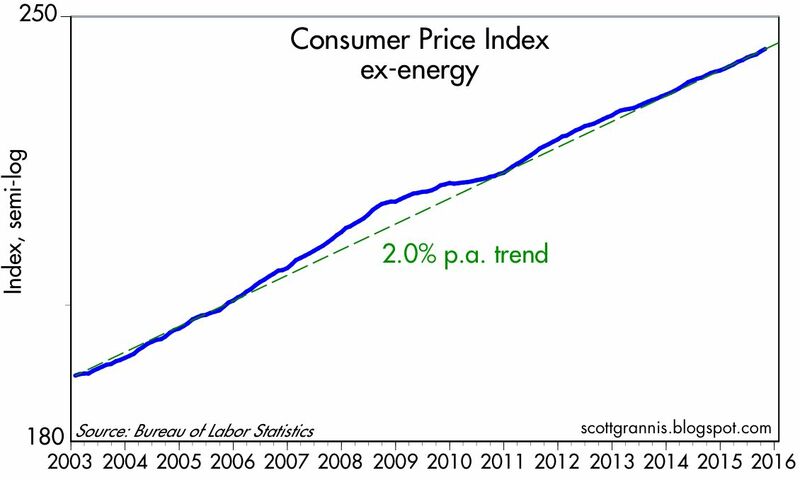 Ex-energy, consumer price inflation has been running about 2% per year on average for the past 13 years. What's notable is not the low level of headline inflation, it's the continued existence of 2% core inflation despite the fact that economic growth has been unusually sluggish for a number of years. The chart above compares headline CPI inflation with "core" (ex-food and energy) inflation, with the former being much more volatile than the latter. As the chart above attests, the difference between headline and core inflation is almost entirely due to energy prices. When you strip out energy, you find that inflation has been rising at a 2% annualized pace since the end of 2002, with the exception of the 2005-2008 period, when inflation briefly accelerated. That acceleration followed several years of aggressive Fed easing (2001-2004), and it prompted a subsequent tightening, in which raised the Fed raised its target rate from 1% to 5.25%. Don't let the low level of headline inflation lull you into thinking that the Fed runs a great risk of triggering deflation or harming the economy if it raises short-term rates to 0.25%. I continue to believe there is a greater risk of inflation accelerating, as it did 10 years ago, if the Fed does NOT raise rates. Starting from the premise that the world's capital markets are intimately bound together—that the expectations driving stock prices are the same ones driving bond yields, for example—it should be possible to infer from the prices of different assets the market's implied economic outlook and risk preference. In other words, there ought to be one "story" that explains the market prices we observe. This post focuses on TIPS prices, gold prices, and PE ratios, and attempts to deduce what they tell us about the assumptions embedded in the market. 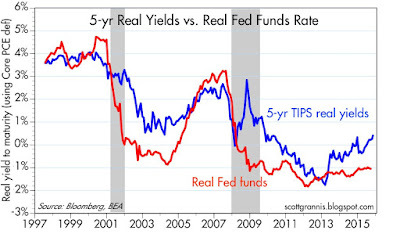 The chart above compares real yields on 5-yr TIPS with the real Fed funds rate. 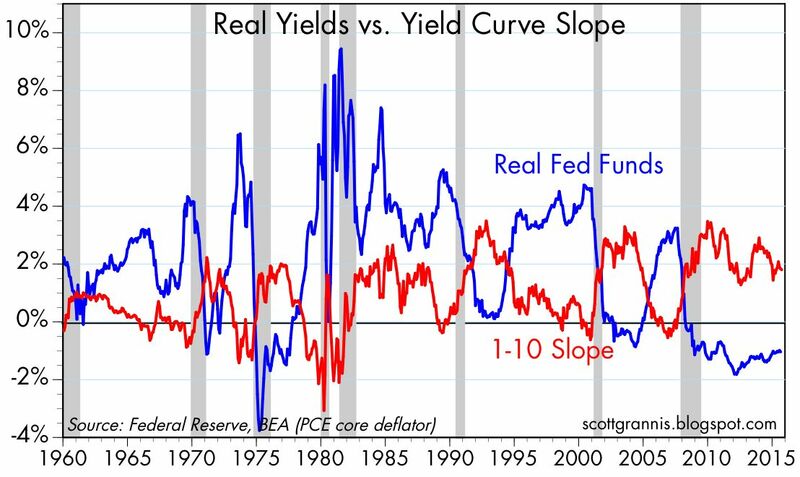 For one, this tells us that the real yield curve today is positively sloped (i.e., short-term real rates are lower than medium-term real rates), and that, in turn, means that the market expects the Fed to tighten monetary policy going forward. Real yields on 5-yr TIPS today (0.4%) can be thought of as the market's expectation for the average real yield on Fed funds (currently about -1%) over the next 5 years. This condition must hold in a market equilibrium, leaving investors indifferent between investing overnight or for 5 years. 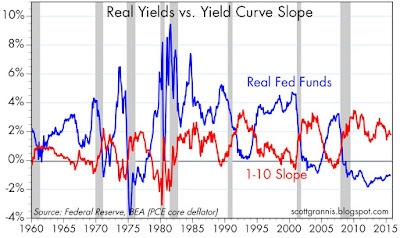 The chart above compares the real yield on Fed funds to the slope of the nominal yield curve. Note that the yield curve is typically positively sloped in the early stages of a business cycle recovery, but that it becomes negatively sloped in the latter stages. Why? Because inflation has typically picked up as the business cycle matures, and the Fed typically uses tighter money policy (which takes the form of higher real yields) in order to "cool off" the expansion and suppress inflation pressures. Every recession in the past 50 years has been preceded by a significant rise in real short-term yields. The shape of the yield curve today and the low level of real yields tell us that we are probably years away from another recession, because the market doesn't expect any aggressive tightening from the Fed for many years. 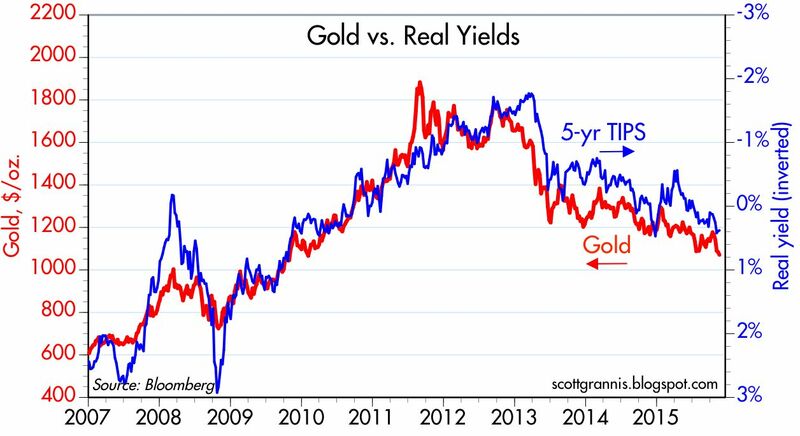 The chart above compares the inverse of real yields on 5-yr TIPS (using that as a proxy for their price) to the price of gold. It's rather remarkable that the two have tracked each other so well for the past 8 years, since these two assets share almost nothing in common. The one thing they do share, however, is that they are both considered to be safe-haven assets. Gold is the favored port in any economic or financial storm, while 5-yr TIPS are not only risk-free but also inflation-protected. So the fact that they are moving together suggests that what is acting on these two prices is the market's degree of risk aversion. Risk aversion was high—and demand for TIPS and golds was strong—a few years ago, when gold hit $1900/oz. and real yields fell to close to -2%. Today we see less risk aversion, because the prices of gold and TIPS have fallen. But both are still well above their long-term averages. The market thus seems to be transitioning from a period of high risk-aversion to lower risk aversion. 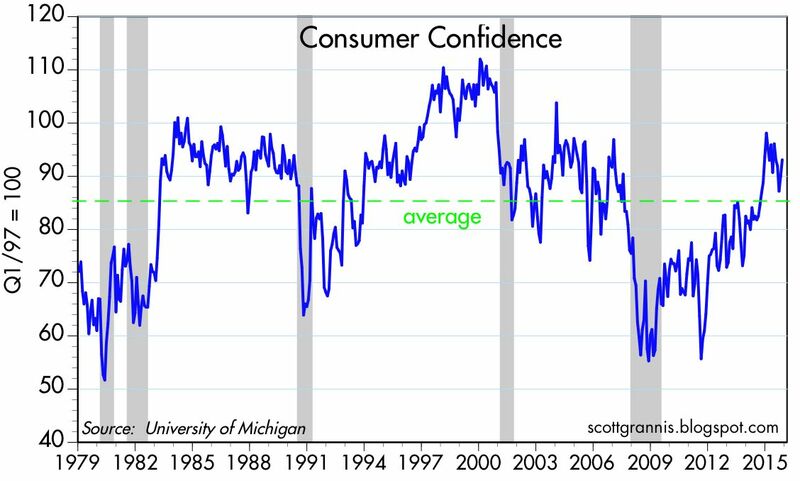 As a corollary we could say that optimism was in very short supply a few years ago and is now beginning to return. But we are still far from a market which is "irrationally exuberant." With the benefit of hindsight, the market was excessively confident when gold approached $250/oz and TIPS yields were 4%, in the 2000-2001 period. The chart above compares real yields on 5-yr TIPS to the PE ratio of the S&P 500 (as calculated by Bloomberg). Here again we see an interesting correlation, with the exception of the 2004-2007 period. This period was one in which the Fed was aggressively tightening monetary policy, which involves forcing real short-term interest rates higher. When the Fed is not forcibly intervening in the market, real yields show a strong tendency to track PE ratios. What does this tell us? 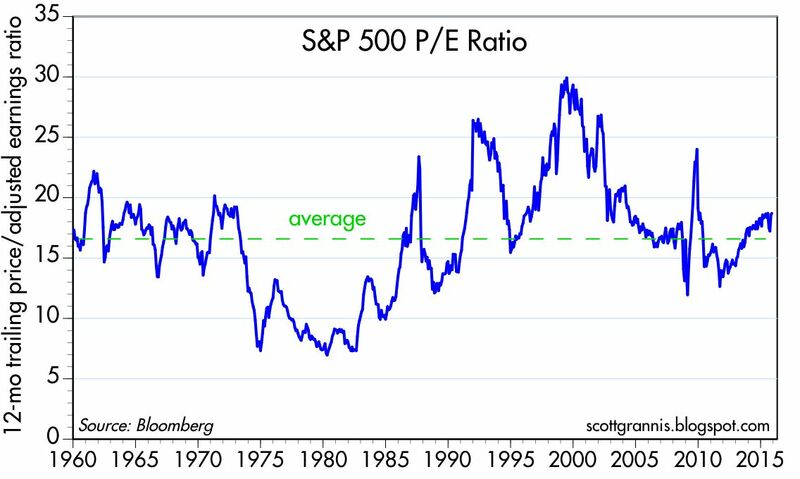 We know that rising PE ratios tend to correlate to a rising tolerance for risk and increased optimism about the future of the economy. Investors are willing to pay more for a dollar's worth of earnings when they believe the economy—and profits—are likely to improve. Today, PE ratios of 18-19 are only slightly above their long-term average. This confirms the message of gold and TIPS, which is that the market is transitioning from being very afraid to becoming cautiously confident. Valuations, in other words are somewhere between cheap and expensive. The economy is growing at a sub-par 2-3% rate, the market is cautiously optimistic, and the Fed is about to begin raising short-term rates in a very gradual fashion. There's nothing big to worry or get excited about, and valuations are neither cheap nor particularly expensive. We've been in a sub-par recovery for years now, thanks mainly to very high marginal tax rates, excessive regulatory burdens, and policy uncertainty, and the market seems to have fully priced this in. So: buy stocks if you think the policy environment is going to improve, and sell stocks if you think the policy environment is going to get worse. These choices are going to become easier to make as we approach the November 2016 elections. The October jobs report came in way above expectations (271K vs. 185K), and even more so considering upward revisions to prior months. 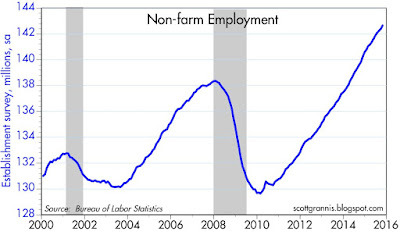 Does this show the economy suddenly picked up speed? No. It's most likely just seasonal and/or statistical noise. 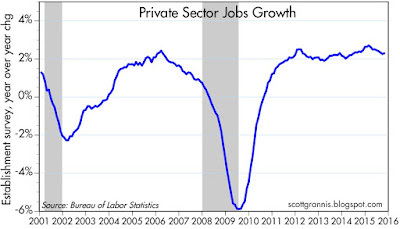 As I've been arguing for months (and as I predicted yesterday) the monthly vagaries of the jobs numbers have not really changed the big picture of the economy, which continues to be one of disappointingly slow but relatively steady growth of 2-2.5% per year. 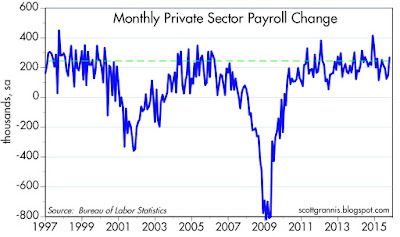 If anything, today's headline should have read "BLS jobs catch up to ADP jobs." Both surveys have been tracking each other very well for the past several years, but the BLS numbers have proved more volatile. They were much lower than the ADP numbers as of yesterday, and now they are above. 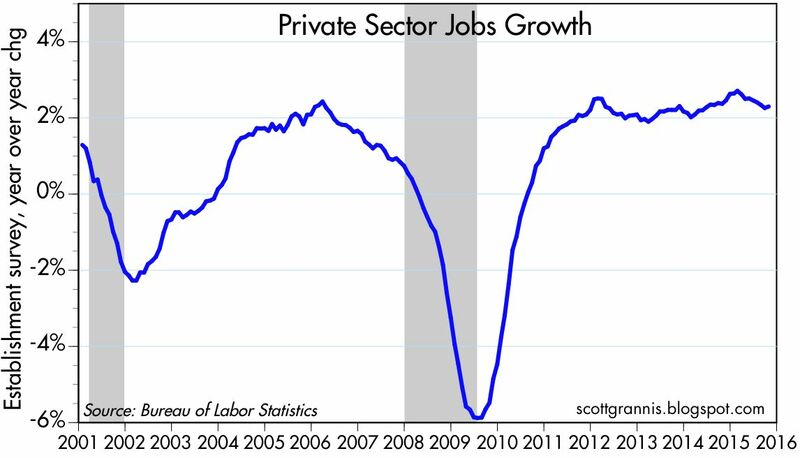 But both are saying the same thing for the past year and two years: private sector jobs growth is averaging about 225K per month. 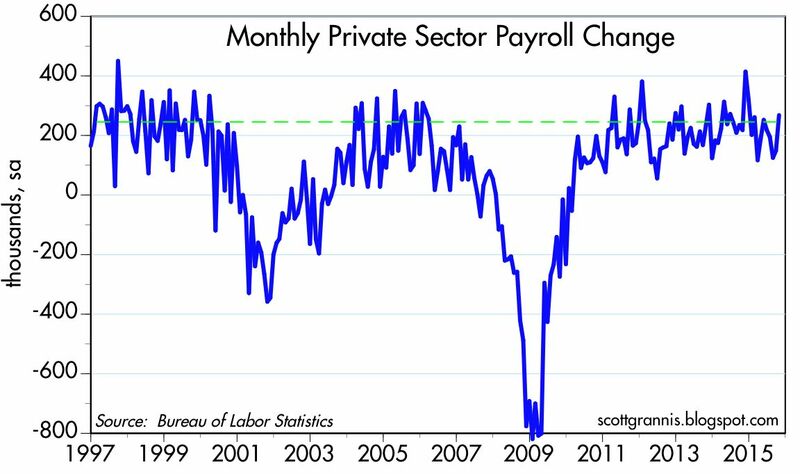 The first of the above charts shows the monthly change in private sector payrolls, while the second shows the year over year rate of growth. 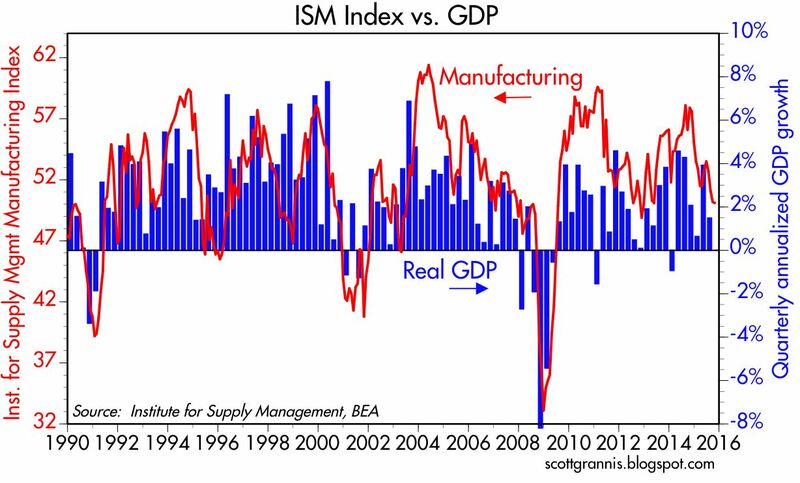 Essentially, today's report simply confirmed that the economy is "steady as she goes." 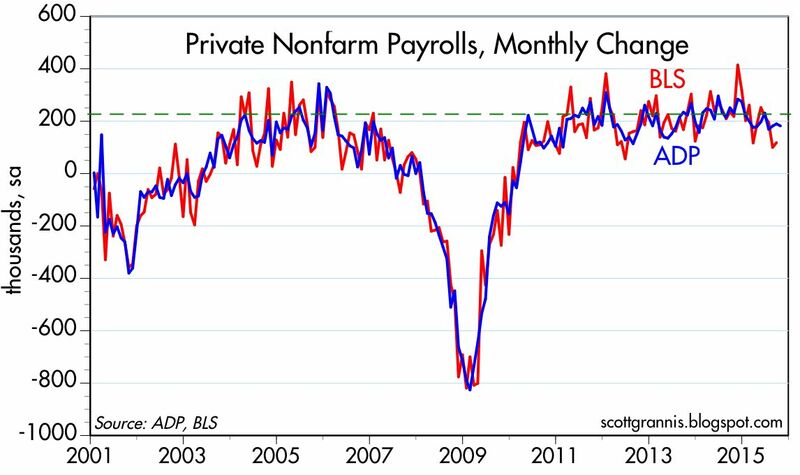 If this had been a normal recovery, there would be many millions more employed and the economy would be about $2.6 trillion bigger, But let's not forget that there has been a net increase of about 5 million private sector jobs since the peak of the prior business cycle expansion. We are making progress, but it's painfully slow. 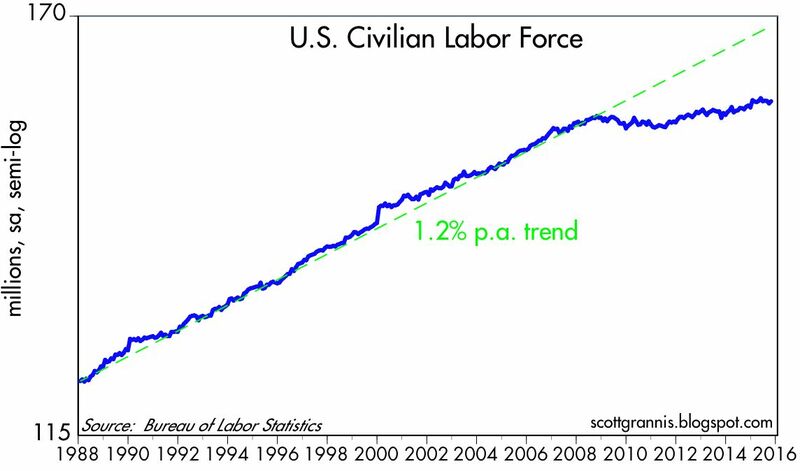 Businesses are not investing much, and the labor force is not growing much. The economy suffers from a failure to thrive, for a variety of reasons that are by now well-known: very high marginal tax rates (punitively high on businesses), increased and heavy regulatory burdens, generous transfer payments, policy uncertainty, and lingering risk aversion left over from the Great Recession. The Fed can raise rates at the FOMC meeting (the implied probability of which is now 70%), and the sky is not going to fall. When they do raise rates, some of the policy uncertainty will fade, and the economic fundamentals will improve on the margin. This is all good news. Just eyeballing the chart above tells me that the BLS's estimate of private sector employment tends to be more volatile than ADP's, and both tend to track each other over time. That further suggests that the BLS jobs number—to be released early tomorrow—has a decent chance of beating expectations (currently about 170K), since the ADP numbers have have been averaging just under 190K for the past 7 months. This ostensibly "good" news would probably be disappointing for the market (at least initially), since it would raise the probability of a Fed rate hike next month. The market wouldn't be caught totally by surprise, however, since the implied probability of a December rate hike has risen from 30% two weeks ago to 56% today. I think the market is beginning to realize that the economy is in decent enough shape (growth unlikely to change much from the 2-2.5% trend of recent years) to withstand a very modest increase in short-term interest rates. In my view, the Fed can hike rates any time they like and it's not going to worry me. Rates naturally move higher as optimism increases and the economy matures. Higher rates would be a confirmation of growth, not a threat to growth. As the chart above shows, large companies have not been very dynamic over the past two business cycles. 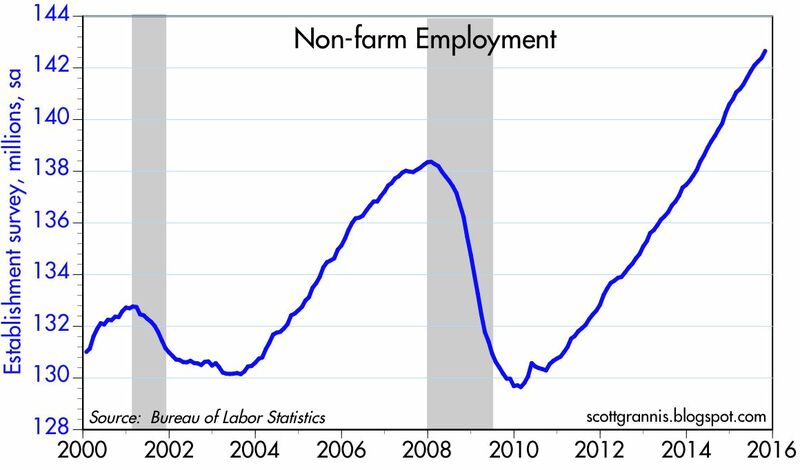 Payrolls at large companies (500 or more employees) today are still about 10% below where they were in early 2001. Meanwhile, small and medium-sized companies have posted much more impressive growth. 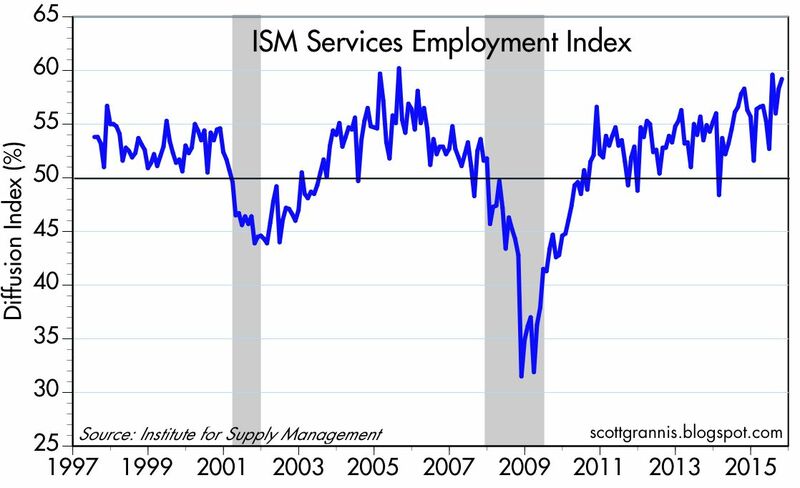 Manufacturing hasn't been very impressive in the past year or so (weakness in the oil patch), but the service sector (which is far bigger) has been pretty impressive. The ISM service sector business activity index is at the high end of its range. More evidence of the hot-cold economy we're in: some do very well, others not so much. But on average things are growing at a fairly steady pace. The employment sub-index of the ISM service release yesterday bounced back to a very strong level. This suggests that businesses feel pretty good about the future, because they plan to increase their hiring. 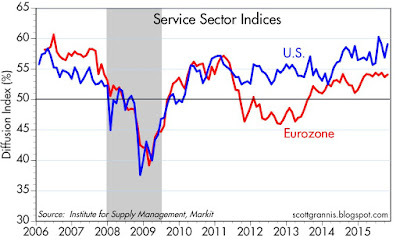 The service sector of both the U.S. and Eurozone economies are doing reasonably well. Between them, they account for a significant share of global GDP. Reason to remain optimistic or at least refrain from being pessimistic. 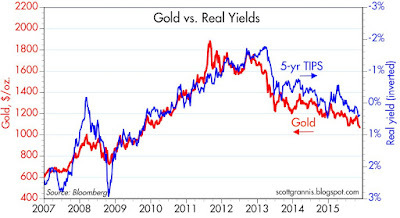 The prices of 5-yr TIPS (here proxied by the inverse of their real yield) and gold continue on a downward trend. The market is gradually losing its pessimism (which, at its height drove gold to $1900/oz and real yields to -2%) and coming to accept that the economy is likely to continue to grow, albeit slowly, and that the Fed is likely to acknowledge the improvement in expectations by raising rates a bit. This last chart illustrates how real yields tend to track the economy's real growth rate. Both have been rising a bit in recent years. Nothing to get excited about, but somewhat reassuring nevertheless. Wake me when real yields on 5-yr TIPS break through 2%, and I'll wager the economy will be doing a whole lot better. And the Fed will be paying IOER of 3-4%. October auto sales beat expectations. 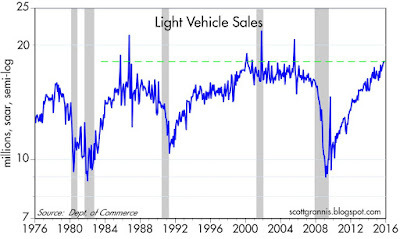 Sales are up 10% in the past year, and they have doubled since their Feb. 2009 low. That works out to an annualized rate of increase of 11% per year. This is one more example of one of the "hot" sectors of the economy. 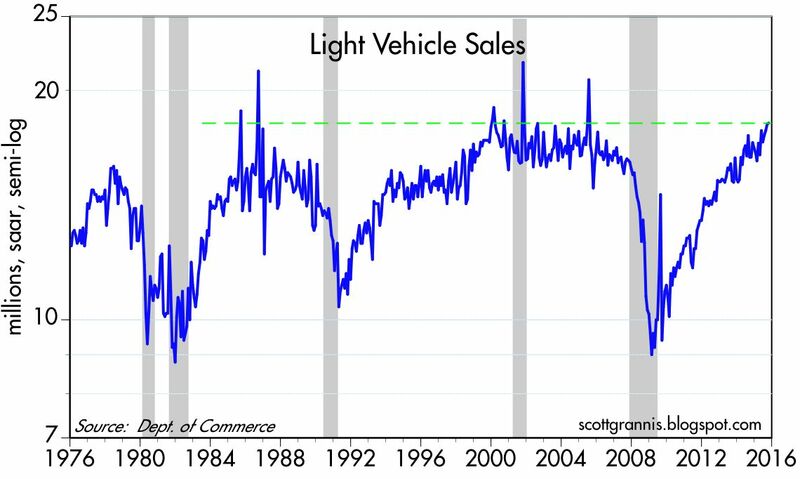 Housing and autos are on fire, and that says this is not a fragile recovery. Starting 11 weeks ago, the market suffered a collapse that erased 11% of the value of the S&P 500 in a mere 6 days. Today, it fully recovered from that collapse, and is up 2.2% for the year to date. The apparent cause of the collapse? Fears that the Chinese economy was in free-fall and sharply lower oil prices would produce a wave of defaults starting in the energy sector and spreading to others. Investors extrapolated these fears and began worrying about another global contagion that could rival the near-collapse of the financial markets in 2008. Yet all that has happened between then and now is that a slower-growing China and lower oil prices were not, in fact, contagious. China is not in free-fall, and oil prices have stabilized around $45. Economic life goes on, unperturbed by the problems in China and the oil patch. Equities have rallied because the future did not turn out to be as bad as investors had feared. This has been the meme of the entire recovery which began in 2009. Equities haven't rallied because things have improved; this is still the weakest recovery ever, and there are no convincing signs to suggest the recovery is going to get meaningfully stronger. No, equities have rallied because there has not been a meaningful deterioration in the economic fundamentals—a deterioration significant enough to justify sitting in zero-yielding cash while foregoing the much higher yields on riskier investments. As the chart above shows, there has been a very strong inverse correlation between equity prices and the level of fear, uncertainty, and doubt prevalent in the market (using the ratio of the VIX index to the 10-yr Treasury yield as a proxy for FUD). As fears have declined over the past 11 weeks, equity prices have risen, in virtual lockstep. 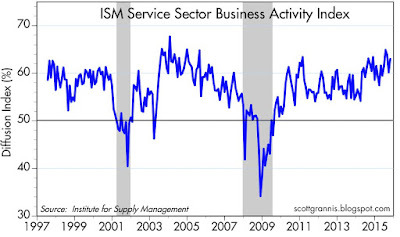 The ISM October manufacturing survey wasn't particularly impressive. In fact, it suggests that economic growth in the current quarter will remain disappointingly slow. 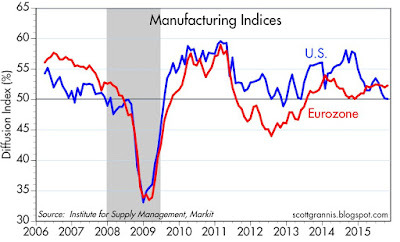 Fortunately, manufacturing conditions in the Eurozone have firmed marginally over the course of the year. Still, there's nothing here to get excited about, except to the degree to which these surveys rule out another recession. 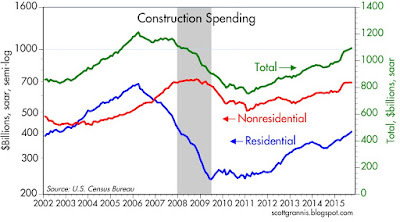 Meanwhile, September construction spending showed continued strong gains. 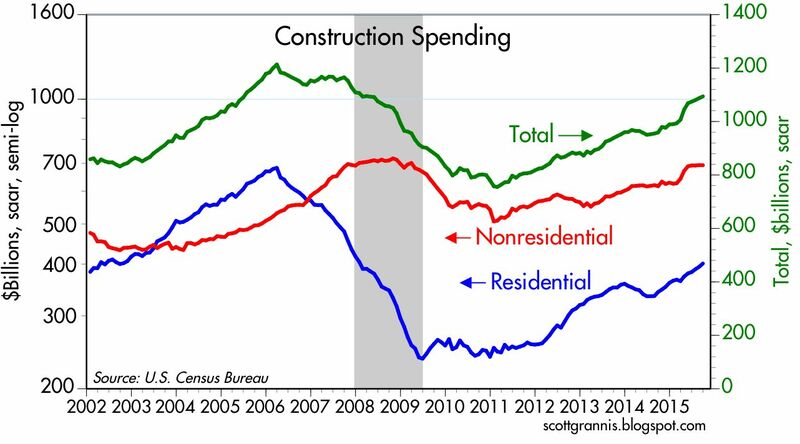 Total construction spending is up 14% over the past year. led by a 17% advance in residential construction. It's a hot-and-cold economy, with some sectors (e.g., construction) doing very well while others (e.g., energy production) are doing poorly. This mixed bag of indicators has been highly conducive to FUD. What was the secret to understanding that the world was not on the verge of another recession? 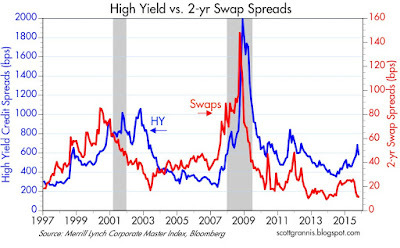 Swap spreads, which have been and continue to be very low. 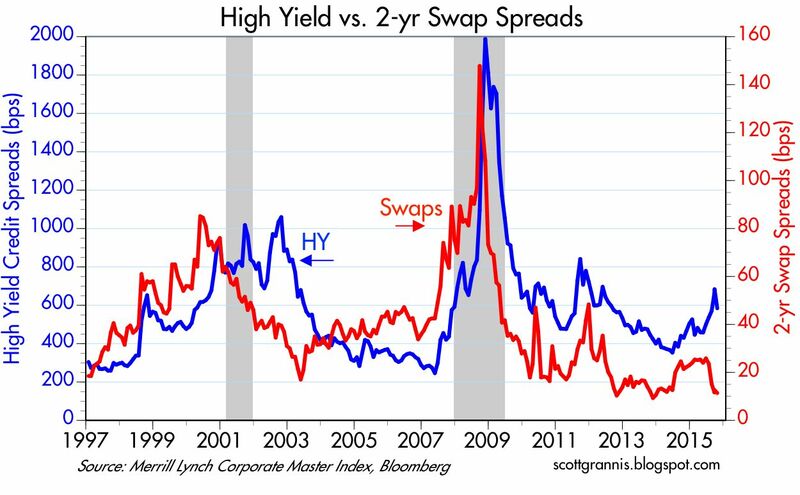 As I've stressed for months, very low swap spreads are an excellent indicator which suggests that systemic risk is low and financial markets are very liquid, and therefore the economic outlook is more likely to improve than not. Liquid markets and low systemic risk allowed market forces to sort out the difficulties presented by a slower-growing China and a lower oil prices. Financial markets have in effect been a very efficient stabilizer which has insulated the global economy from the tremors in the Chinese market and in the oil patch. This stabilizer functions by allowing large institutional investors to efficiently and effectively transfer risk via swap agreements. Swap spreads continue to point to improving conditions ahead.